Can climate change explain the conflict in Syria? Prince Charles once famously listed drought as a root cause of the war. Similar arguments have been made by other campaigners like UN climate envoy Mary Robinson, celebrities such as singer Charlotte Church, and even politicians like Bernie Sanders (who claimed “climate change is directly related to the growth of terrorism”). Their views are supported by academic research on Syria and elsewhere. But now a new study in the journal PNAS suggests that the link between climate change and armed conflict is overhyped. This matters because once an entirely preventable conflict is described as a “climate war” it risks being perceived as “natural”. But though the climate may be changing, these conflicts aren’t inevitable. Calling Syria a climate war, for instance, means ignoring longer-term historical tensions across the region, and lets the humans involved off the hook. In their study Nina von Uexkull and colleagues examined the “conflict potential” of the sort of droughts that will become increasingly common under global warming, particularly in already arid and semi-arid areas. The researchers effectively combine three sets of data to look for any links: conflict event data for Asia and Africa over the past 25 years, ethnic settlement data (because ethnicity is often a key cause of conflict), and remote sensing data on what peasants and farmers grow on their agricultural land. Our well-meaning celebrities and politicians would perhaps be surprised to hear that Uexkull and colleagues found the impact of drought on conflict was generally “limited”. 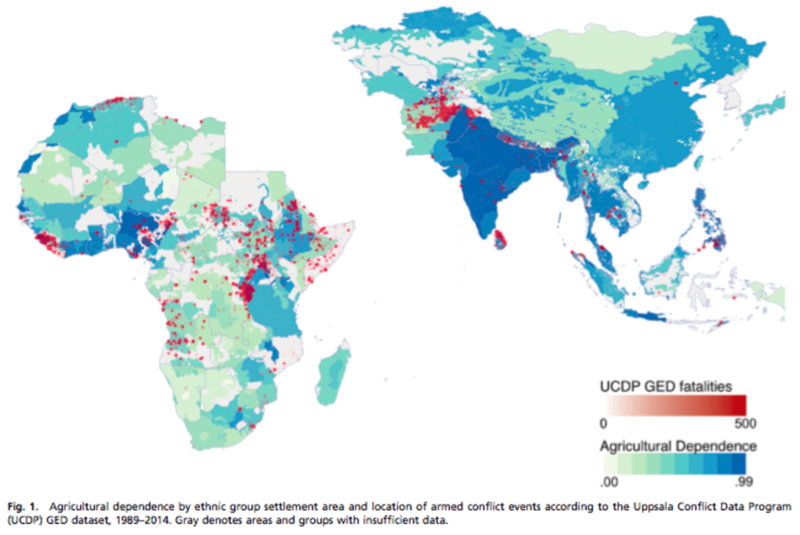 Drought does explain some of the variation in whether or not conflicts kick off, but the “substantive effect is modest” compared with ethnic political exclusion, proximity to pre-existing violence or various country-specific risk factors. Having said that, drought does make sustained conflict a lot more likely among groups of people in the least developed countries who depend on agriculture. These people are already very poor and are, as Uexkull and co put it, “particularly vulnerable to natural forces”. As with other climate change impacts, drought-driven conflict will most affect the already poor and vulnerable. Now, why should these findings not surprise us? First, we already know how resilient many communities can be when faced with climate change. Some rely on ancestral knowledge of how to adapt their agricultural practices to droughts, or they introduce new drought-resistant crops. Some have strong political backers in government, and are able live on hand-outs, while others are able to diversify their incomes. So, what this study by Uexkull and colleagues confirms is that most communities are in fact quite climate resilient. It generally takes a lot more than a dry spell to kick off a war. This should give us some hope that more intense weather events, such as severe droughts, do not automatically lead to more conflict or even civil war among those affected. Second, we already know that the most vulnerable communities, especially smallholding peasants in the poorest countries, are the least resilient to external shocks. These shocks can take the form of rapid political change, fluctuations in global commodity prices or – as discussed – severe droughts and other weather events. Global warming isn’t the first big shock to peasants around the world, and it won’t be the last. The very foundation of Britain’s industrial revolution – starting in the 17th century – was the enclosure of agricultural land, forcing millions of peasants into the cities to find often inhumane work in the sweatshops of Manchester and the other big industrial cities of northern England. The same process is still ongoing today, though the attention has shifted to sub-Saharan Africa, India, Latin America and other so-called “developing countries”. “Development” for peasants often means dispossession, land-grabbing or being exposed to the perils of global free trade. The very existence of the popular Fairtrade label suggests that free trade is not fair enough. Yet, even Fairtrade often cannot sustain small, vulnerable farmers’ livelihoods. My point? Climate change is merely the latest external shock to the livelihoods of poor communities who live off the land. That doesn’t justify it, of course. But it does mean that those worse affected have, to some extent, seen and dealt with this sort of problem before. So, of course, climate change will increase the likelihood of armed conflict among communities that already have very little. Of course, it is important, as Uexkulla and colleagues argue, to ensure poor communities who depend on agriculture are able to adapt to a warmer world. But let us not use climate change as a way to naturalise terrible conflicts such as the war in Syria. And let us not forget the disastrous history of how “development” has often treated peasant and smallholder farmers who feed the rest of the world.